Inventor recognition programs can excite and motivate faculty and other inventors to participate in the innovation ecosystem, says Laura Schoppe, MBA, MSE, president of the technology transfer consulting firm Fuentek LLC in Cary, NC. But it takes more than just a quick thank you lunch to have a significant impact. This past May, the Office of Technology Management (OTM) at Washington University in St. Louis held its inaugural Celebration of Inventors, and the feedback from faculty and other inventors underscores the importance of these events. “I thought we were providing a nice thank-you. However, at each turn, I am amazed by how meaningful this was to our faculty members,” says Nichole Mercier, PhD, OTM managing director. The excitement wasn’t limited to inventors. “The Monday following the event, every single pocket of our office was talking about how wonderful this event was, how good they felt about having participated in it, and how excited they were about next year’s event,” says Mercier. 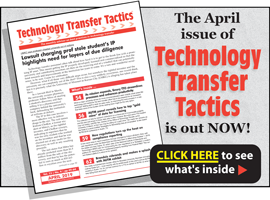 A detailed article filled with best practices TTOs are using to maximize the impact of inventor recognition programs and events appears in the July issue of Technology Transfer Tactics. To subscribe and access the full article, plus get more than 11 years of archived success strategies and expert guidance on improving TTO performance, CLICK HERE.